We offer our clients with an extensive gamut of stainless steel flanges that are fabricated using unblemished quality raw material. Widely used by our clients all over the world, these carbon steel flanges confirm to international standards of quality. We bring forth a comprehensive range of high standard nickel and copper alloy flanges, that are catering to the demands of different industries. These flanges have gained high appreciation for their dimensionally accurate and corrosion resistant features. 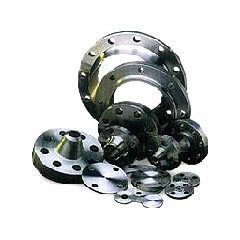 Fabricated from industry grade materials, all these flanges are ideal for high temperature & pressure applications. We welcome bulk orders and are capable of fulfilling them within stipulated time frame. sizes 1/2" to 200" or even customs shapes and sizes.